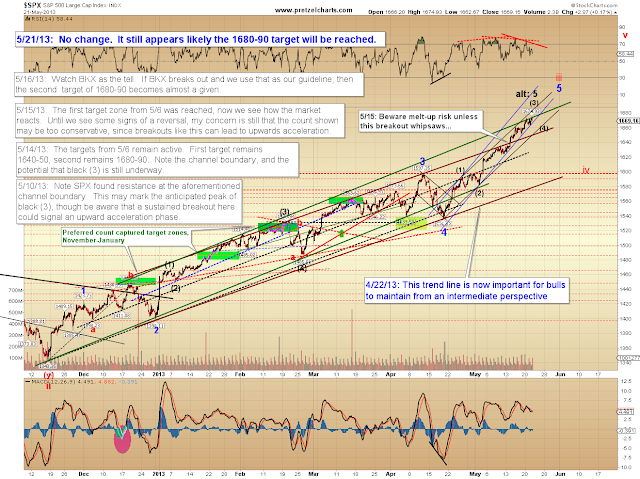 Pretzel Logic's Market Charts and Analysis: SPX and Apple: Is Apple Due for a Bounce? SPX and Apple: Is Apple Due for a Bounce? “In reading The History of Nations, we find that, like individuals, they have their whims and their peculiarities, their seasons of excitement and recklessness, when they care not what they do. Apple (AAPL), once the darling stock of the investment world, is down more than 35% since reaching its peak of $693.21 in September 2012. Interestingly, this price peak came about a year after the fundamentals started indicating things were headed in the wrong direction: Apple's iPhone and iPad profit margins actually peaked in the second and third quarters of 2011, respectively -- in fact, iPad margins are now less than half of what they were at that peak. And while some investors bought Apple because they genuinely loved and believed in the company, more and more fund managers began buying it simply because the price seemed invincible and destined to head higher forever. I even seem to recall seeing an interview about Apple in the heyday, where the analyst said, "Apple is a bargain at $1000." I wonder if he still feels that way? Essentially, despite the falling margins, the stock fell victim to its own momentum and entered a blow-off parabolic rally in early 2012. It wasn't too long ago that it was still fun to say "Apple is the market," but that saying no longer applies. Since autumn of 2012, the S&P 500 (SPX) has been in nonstop rally mode; but Apple's been on the outs. And as is so often the case with parabolic rallies, the stock gave back all those late gains with equally-blinding speed. In the chart below, we can see that Apple and the SPX used to be fairly well-correlated, but recently they've been moving in completely opposite directions. Note the chart is logarithmic scale, so the recent decline in AAPL doesn't look nearly as devastating as it's actually been for investors, most of whom do not have the benefit of being able to spend "logarithmic money." I didn't call attention to Apple simply to illustrate how quickly "darling" can turn to "ugly" in the investment world (though there is a broader lesson to be learned here); I called attention to it because Apple looks like it finally has an opportunity to put together a more meaningful bounce. I'm not certain it will, of course, but I've put together a couple charts which should help us figure out where it's headed. Let's start off with the daily: I'm inclined to think it has more bounce left in it because the rally from 382 appears to be cleanly impulsive (meaning it has five waves). There is only one way a five wave rally could fit in this position and not have prices ultimately head higher, and that would be if this pattern is a somewhat rare "running flat" correction -- so I have to favor the odds that the rare beast isn't the one who's shown up at the party this time. Now, there are two ways we can get to higher prices: the first is fairly direct, and is shown in blue below. The second heads a bit lower first, but should remain above 382 (shown in black); if AAPL sustains trade beneath 382, then all bets are off. I've noted the trigger levels to watch, and a series of corresponding trigger targets, on the chart below. NOTE: I just checked another data source, which has 385.10 as the 52-week low for Apple. Apparently Stockcharts.com is giving a bad quote on Apple. As you can see on the chart below, Stockcharts shows 382.57 as the low. 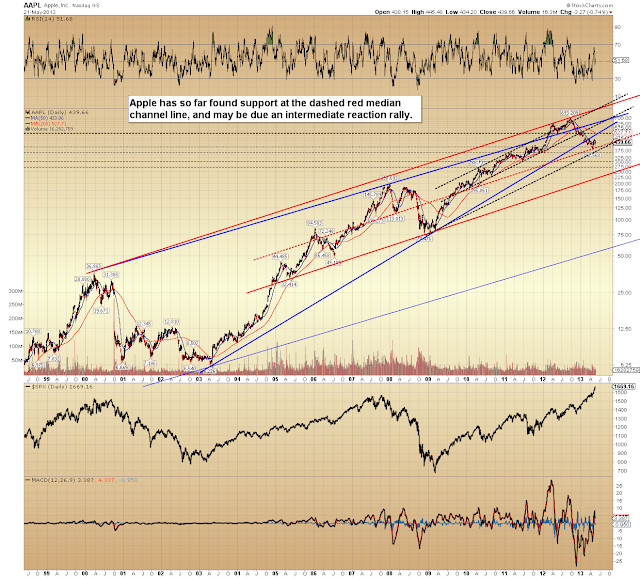 Zooming in on a five minute chart of AAPL, I'm unable to rule out either path until the market makes its next move. Sustained trade below 430 would hint at the black path above, while trade below 418 would largely confirm it. 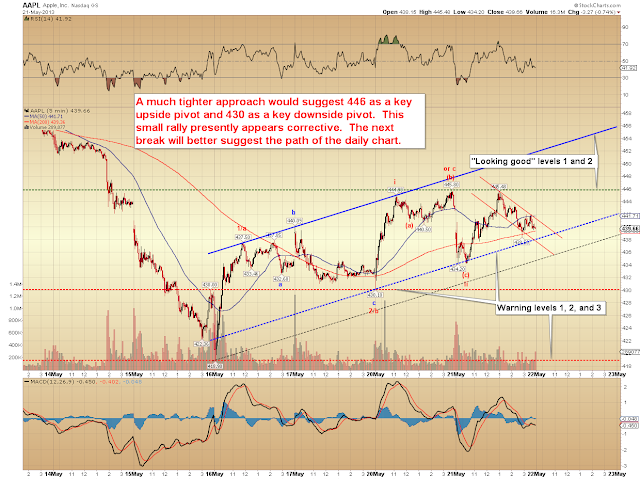 Sustained trade above 446 in the near future would suggest the blue path. 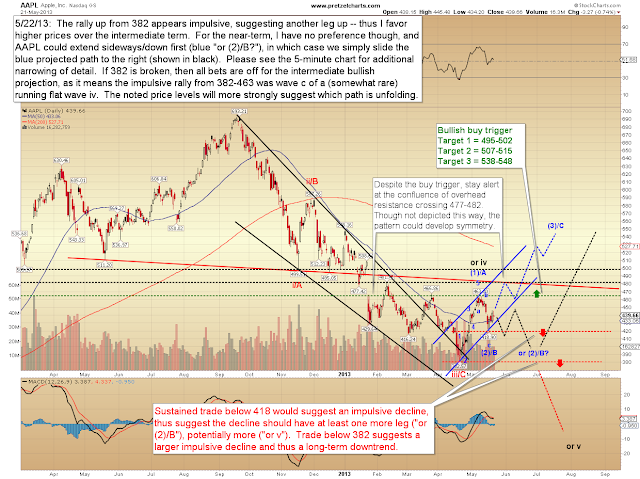 There's been no change in SPX, and it still appears likely the second target of 1680-90 will be reached -- honestly, SPX has been kind of boring to write about lately, which is why I decided to share some of my chart work on Apple. Once SPX claimed the 1600 zone, we pretty much knew to expect 1640-1650; and once BKX claimed 61.06, we knew to expect 1680-1690 SPX. There's been little in the way of excitement since; and that's a good thing for anyone who got long at the breakout of 1600. In conclusion, SPX has come a mere 5 points from the target zone, and barring a surprise, presently looks reasonably likely to reach it. Assuming we get there, we'll reassess the outlook at that point. 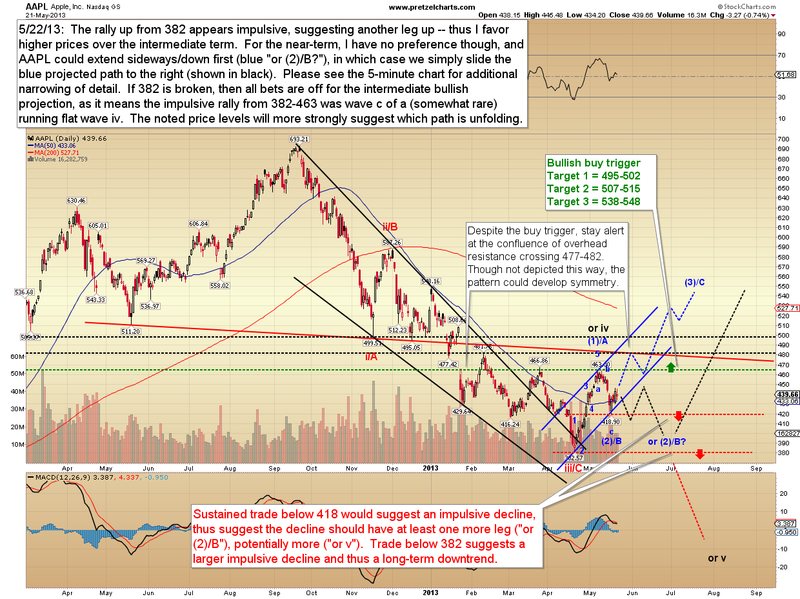 Meanwhile, Apple may present an opportunity -- and if nothing else, there are some fairly clear signals and levels to watch. Knowing when and where the odds are shifting in order to get away from a losing trade can be just as important as being able to "predict the future." Trade safe. Your trees can provide natural cooling by shade providing your house. Making use of mulch on prime in order even worse everything look attractive. hi i have been reading your blog for sometime, and my only regret is not following your advice for last few months. kudos to you for forecasting 1680-1690. 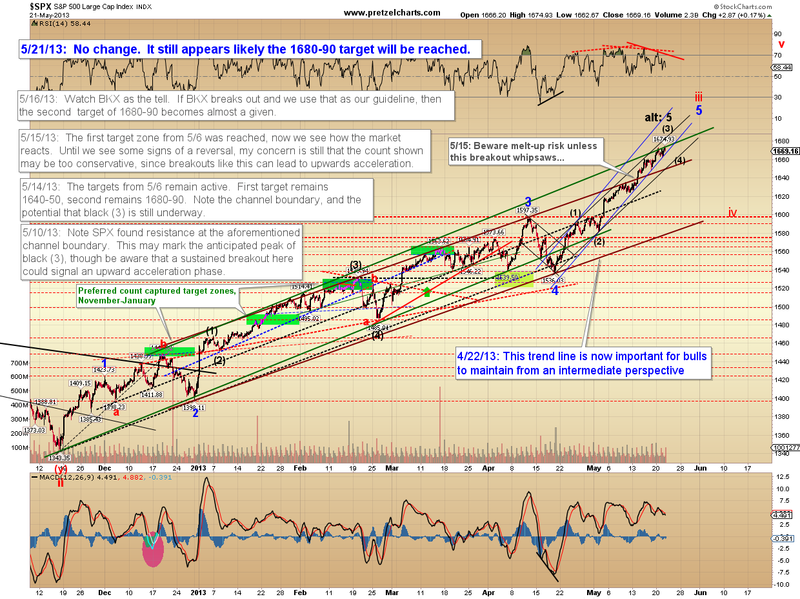 SPX reached 1687.18 this AM, and then headed down rather quickly. notice BKX also had a volatile day (62.49 down to 60.75 and close at $60.92). looking forward to your thoughts about where SPX & BKX goes from here. It isn't really several queries of which haunt people each and every getting Lawyer service providers came up. I kept the group situation to me for a a very long time.